raspberri cupcakes: Chocolate Chip Buttermilk Cake with Orange Icing & a Giveaway! 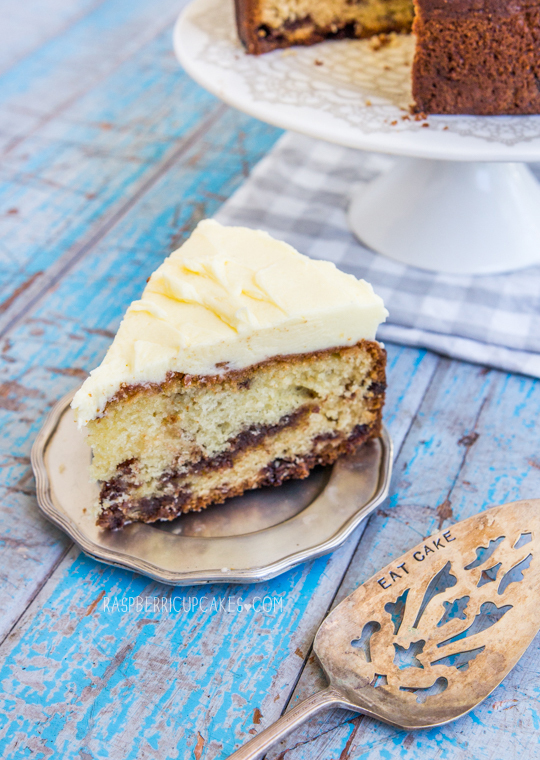 I'd love a caramel macadamia cake - my mouth is watering just thinking about it.... yum! Ever since your strawberry champagne cake I have loved the idea of bubbles in a celebration cake! I would go for a champagne and pear or apple cake for lovely sweet but fresh flavours! Cannot wait to try this tea cake!! My mum is visiting next week while my dad has heart surgery so she will be in need of some lovely comfort food I'm sure! i love cake of allsorts! 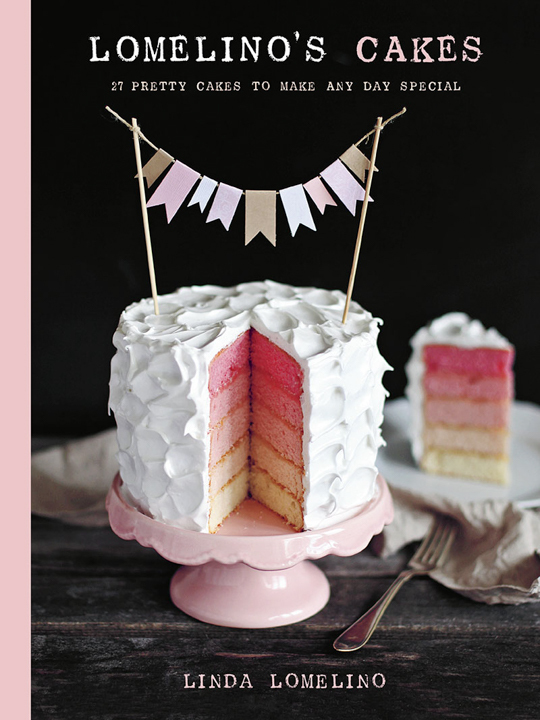 my dream birthday cake would be a tall ombre chiffon with a generous piping of rosewater flavoured buttercream rosettes! My dream birthday cake would be a layered spong oozing with fresh whipped cream and home made berry jam. Presented on a beautiful cake stand and topped with fresh roses and jasmine trailing down. Your cakes always look amazing. My dream cake is pretty much one I didn't make myself:) However as long as it involves chocolate and strawberries I'm happy. I love Linda Lomelino! My dream (heck, anytime really) birthday cake would have to be your brown butter cake with vanilla bean cream and salted caramel. If there ever was a dream in a cake it's that one! That book looks divine! My dream cake would be a cheesecake using your pretzel base, a layer of cheesecake and a layer of chocolate cheesecake, covered in fresh raspberries and chocolate flakes. That would be the dream! A raspberry and white chocolate cheesecake, made by me, since I use any excuse to bake a cake, haha. 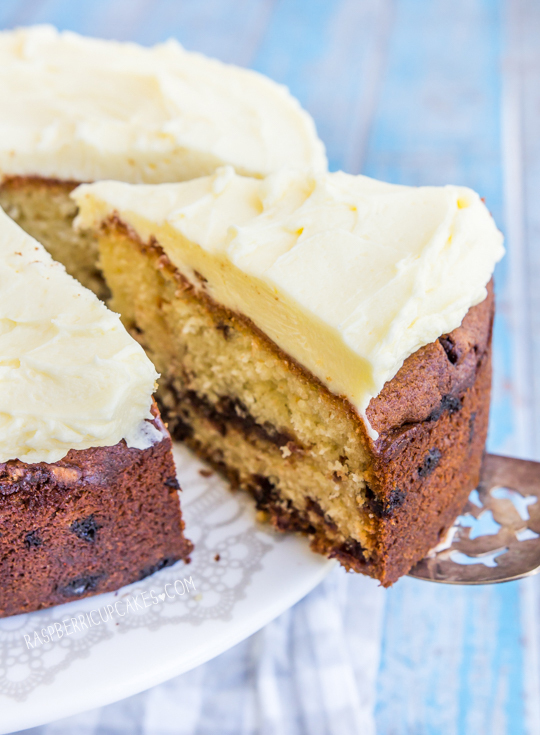 My ideal birthday cake would be a half-and-half cake to share with my twin sister so we could both have our favourite birthday cake (without having to compromise on just one flavour)! My half would be a white chocolate mud cake with salted caramel frosting and the other half a dark chocolate mud cake with raspberries and ganache (my sister's favourite). Yum! my fav bday cake would be a three tier brown sugar pavlova, filled with a yogurt cream type frosting and topped with raspberries and more cream. cheers .p.s your blog is great and i love your recipes, made many a cake from them. Ooh, my favourite birthday cake is always a New York style baked cheesecake. Plain and simple, but always a winner! Red velvet mixed with white chocolate chips, cream cheese frosting and topped off with sweet strawberries is my current dream cake. My dream birthday cake is my sister's birthday cake from nearly 20 years ago now. My mum worked so hard early in the morning before we woke up to make a castle cake with four towers and a Kit-Kat drawbridge. I can still remember how delicious it was. Even now, when I look at photos of that cake I feel happy. 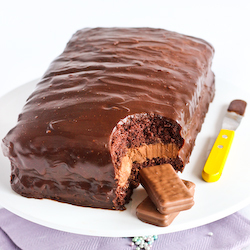 My dream birthday cake would be chocolate with peanut butter frosting and a salted caramel drizzle. I love the sweet and salty combo! My dream cake would be a delicious caramel cheesecake! My favourite cake is your recipe for banana cake with salted caramel icing, I finally mastered it and it never gets old! I'm so excited about this giveaway! I love Linda Lomelino! My dream birthday cake would be a combination of silly/novelty and pure deliciousness. My mum doesn't like baking so our birthday cakes growing up were always store-bought or ice cream cakes, and while they were always delicious, I was pretty envious of my friends who had birthday cakes in the shapes of butterflies or trains or dinosaurs or whatever. So I think my dream birthday cake would be something like your mint chocolate chip cake in the shape of a T-Rex, slathered in that gorgeous green minty icing, and maybe accompanied by macarons in the shape of dinosaur eggs! My dream birthday cake would be a four-layer mud cake. There'd be one strawberry mud cake layer (does that even exist?! I hope so! ), a vanilla/white chocolate mud cake, a caramel mud cake, and a chocolate mud cake. I don't know if it would even work with the weight of the cakes, but it would be awesome if it did! Your blog and Linda's inspire me so very much! I think your Caramel mud cake with salted caramel and pear would be pretty darn ideal! Or maybe a vanilla and cherry type of situation but then again your vanilla cake with rhubarb and strawberry that I made for my Mr 6's birthday was pretty darn sensational! Thanks for such an inspiring blog; you are extremely talented! These cake seems too delicious. I am a great fan of Linda Lomelino´s too, so I bought the book in english as soon as I knew the new. I had a peach coconut cake once and I am still dreaming about it! My dream birthday cake is a classic yellow cake with an whipped cream and toasted almond filling (four thin layers!) and a dark chocolate icing. this cake I just make for myself! My birthday is is summer so anything with lots of fresh fragrant strawberries will keep me happy. My dream birthday cake is a vanilla and tonic cake infused with gin and lime syrup, topped with lemon glaze and fresh strawberries. My dream birthday cake would be any cake not made by me. With 3 little ones the only cakes I see are Dora, Peppa Pig and Fireman Sam cakes. What I'd really love is a decadent red velvet on the inside and dark chocolate on the outside cake. Such a great frosting tip! I love learning new things too! This looks awesome. My dream birthday cake would be the one I always wanted as a kid but never got - the lolly stand from the Women's Weekly Birthday Cake Book. I'd go for a lemon coconut cake with a citrus cream cheese icing and my lolly favourites would be bounty, cherry ripe and some maltesers for good measure! My dream birthday cake would be one baked for me by someone I love. I have a reputation as a good baker so people hardly ever bake for me. If I could pick what they would bake for me, - it would be seasonally inspired (my birthday is coming up in late November) it would be a multi-layed bake with alternating layers of soft orange flecked sponge and crunchy meringue interlaced with vanilla whipped cream and lashings of fresh raspberries. Ideally it would be presented with a bunch of peonies, my favourite flowers which are only in season for a brief window around my birthday. I think my dream birthday cake would involve all my favourite elements - salted caramel popcorn, maybe some Pocky, definitely some Cherry Ripe, and some simple vanilla sponge. I would love anything with multiple layers, so much extra love! I think sponge cake. Add fresh raspberries on top and I'm a happy girl! My dream birthday cake would be a giant shortbread cream. I am totally addicted! I love your arnotts cakes - the iced vovo was so much fun to make. I'm always impressed by your cakes, and wish that I could make mine as pretty. They taste great, but aren't as artistic. As for the question, My dream birthday cake is pretty straightforward: Yellow sponge filled with Strawberries and Whipped Cream with White Chocolate butter cream and Shaved Chocolate decorations. YUM. I love a deep dark chocolate cake with vanilla bean buttercream which must be made from REAL butter. It's too dreamy for words. Hmm that tricky. I'm thinking chocolate with some sort of nutella element. 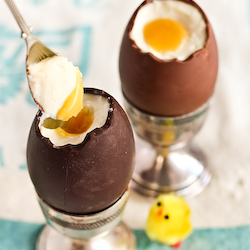 It has to be covered in lots more chocolate as well. Fererro Roche maybe?? 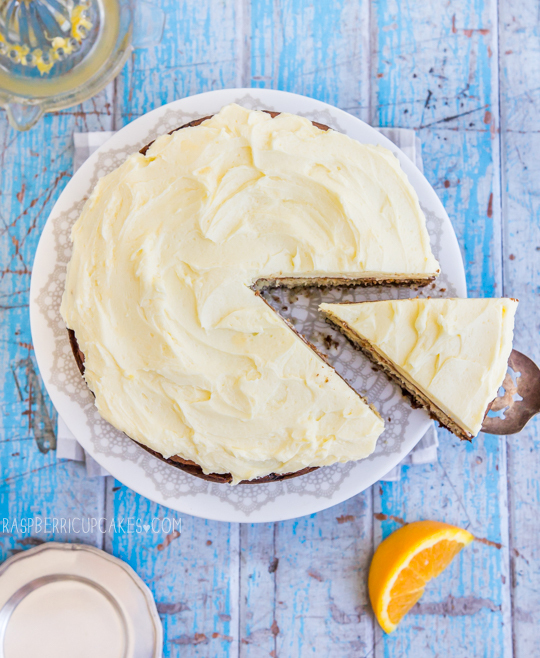 A grapefruit cake with zesty cream cheese frosting! Grapefruit is my favourite fruit so incorporating that in a light, moist cake would be amazing. I think my dream birthday cake would be the ridiculous looking Celebration Cake that Jamie Oliver made on Comfort Food recently, but with some kind of raspberry element involved. My niece keeps asking me if we can make the Celebration Cake together, but I have a feeling the whole thing would collapse in a heap the second I tried to cut it! My dream birthday cake would be pie (lemon meringue), but the rest of my family are CAKE people! All kinds, but they do love a good coffee cake with extra crumb. 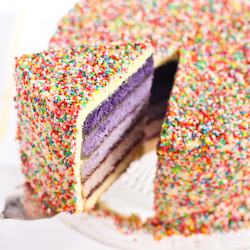 My dream birthday cake would be a meter high rainbow cake! It would be a rainbow stacked cake and have like 15 colours. The icing in the middle would vary between the layers with some having crushed up fruit tingles in it, coconut and strawberry and raspberry swirl. There would be a white icing as the base for the royal rainbow icing that is dripping down the sides of the cake. It would look awesome! My Mum once made me the most awesome birthday cake ever - it was a layer cake with hazelnut meringue on the bottom, vanilla ice-cream in the middle into which she mixed homemade toffee, with another layer of hazelnut meringue and topped with raspberries and this awesome chocolate sauce. It was soo awesome and it looked amazing as well!! This is forever my dream birthday cake!! I made my dream cake for my 21st birthday 3 years ago now. It was a simple white chocolate mud cake, covered in white fondant and i made coral, pink and white floral decorations and had them falling off the cake. It looked like i had bought it, i was so proud of myself, and keeping aiming for more each time i back! I think my favourite birthday cake would be one somebody else made! ;) It would be a layers of fluffy sponge cake, lemon curd and cream topped with candy swirled meringues. Yum! oops, didn't mean to comment twice, sorry! If I could have a morsel of what my heart most desired on my birthday it would be some concoction including peanut butter, chocolate and banana. Perhaps a layered banana cake with alternating layers of rich chocolate buttercream and peanut butter buttercream and then topped with peaks of whipped cream, chocolate shavings, banana slices and a few salted peanuts. oh my oh my I'm hungry. My dream birthday cake would be one that someone else had made! ;) It would be layers of fluffy sponge cake, cream and lemon curd topped with swirled creamsicle meringues. Yum! Easy! My dream birthday cake would be my nanna's lemon sponge with lemon icing. It was so simple, fragrant and delicious but sadly no-one got the recipe before she passed away (a long time ago might I add). Yummy memories!! I love coconut and my dream birthday cake would involve coconut, white chocolate, cherries and lots of delicious whipped cream! My Orange-Poppyseed Cake! 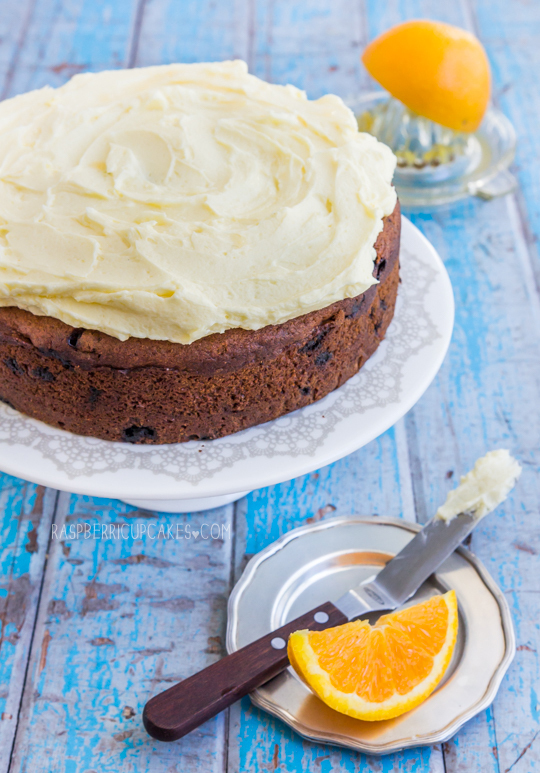 I have devised my own recipe using orange zest, juice and yoghurt (in addition to the regular cakey ingredients) and it's sooo lovely and moist and even halfway healthy! 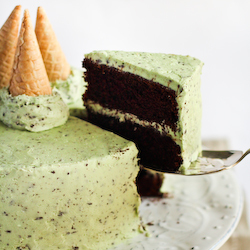 My dream cake would be a french thousand layer matcha mille crepe cake, filed with the aroma of green tea and irresitably soft and velvety filling! My dream cake...hmm...layers of icecream of flavours strawberry cheesecake and blueberry cobbler!! My dream birthday cake would be the lightest, whitest and fluffiest vanilla bean cake that's not to sweet but is a little naughty at the same time. Looks so delicious! You have so many great recipes!